The Forager | That Yum Factor! What is the “The Forager,” you ask? 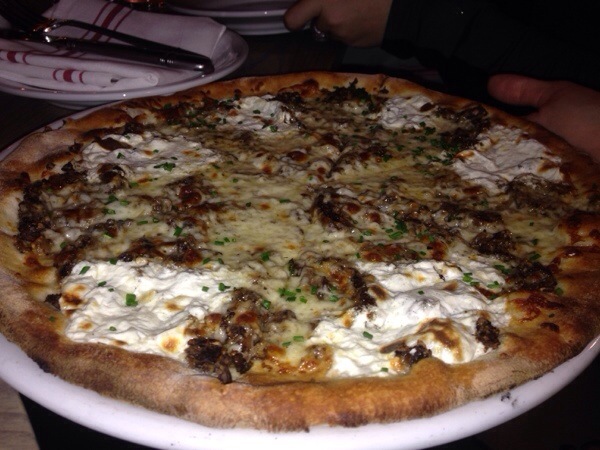 This is Sotto 13’s wood-fired pizza and is topped with wild mushrooms, ricotta cheese, chives, and truffle oil. I did some research and tried several pizza selections from this place, but this particular one has… THATYUMFACTOR! BTW, this place is great for a group brunch. They have an all-you-can drink special (1.5 hours) for $29 per person. You can choose from mimosas, screwdrivers, bellinis, or bloody marys. For food, you can select one of their wood-fired pizzas or choose an assortment of small breakfast plates. Posted in Manhattan - NY, Image format and tagged West Village on February 3, 2014 by thatyumfactor.